Misha was one of our smallest males, however he had an attitude and personality bigger than most. Misha flew home with me when he was 9 weeks old. He was one of those once in a lifetime dogs for me. He wouldn’t have made it in the show ring, or on one of our main teams. But he did everything 150% of his ability. 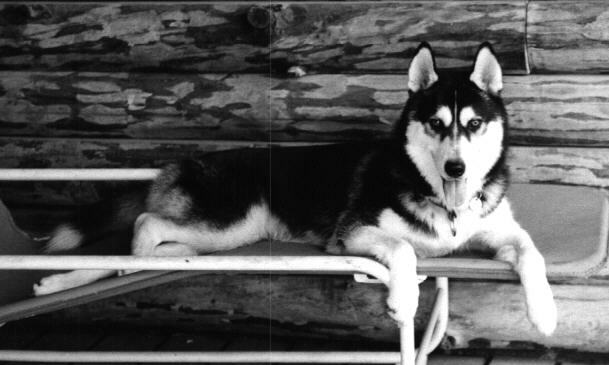 Misha was black and white with brown eyes. I loved his coat, it was soft, shiny and thick. And he was my boy and he let everyone know it, especially my husband. The joke was always if one had to go Misha was here first. I have a large drawing on the wall of my first Siberian. The artist did a wonderful job of capturing Kiri’s attitude and expression. Each time Misha would notice the drawing he would bark-howl at it like Kiri should jump out of the wall and play with him. He would bark-howl, backup and play bow while looking at the picture. Yes, I really should have gotten video of it, but I didn’t. Misha’s nemesis lived in the laundry closet. Well to be more accurate it was hidden in the closet. Because if Misha could see even a small piece of the duster he would go nuts bark-howling at it. When this all started we would show Misha the duster, which was lamb’s wool, and let him sniff it. Then he would proceed to bark-howl at it. He quickly learned that it lived in the laundry closet, so any time the doors were open when we were doing laundry he would look for it and start bark-howling at it. I first moved it from a hook he could easily see it hanging from, to one that was hidden but still accessible. Misha quickly realized where it was and he would look for it there to start bark-howling at it. I finally took to hiding it on the self above the washer. Too often it would get bumped when we were doing laundry and he could see it sticking out over the edge of the shelf. Yep you guessed, he would stand there and bark-howl at it and then start bounce around. Okay, to be honest, we would sometime put it in view just for the entertainment. I never really knew for sure if the duster was friend or foe. Did he want to play with it or kill it?